Have you ever noticed that when you go to publish your book and select a category on Kindle, certain categories just cannot be found? After doing hours of research to find that perfect category for your ebook, you discover that you just cannot select it? As it turns out, Amazon doesn’t offer every existing category when you go publish your book. Well, you wouldn’t be alone in this frustration. However, there is hope. There are a couple ways in which you can ensure that your book is included into the “secret category list” that Amazon doesn’t offer you. Okay, let me be clear. The list isn’t secret. As matter of fact, they even publish a page to help you find out what categories exist that aren’t offered, but we will get into this later. WHY SHOULD YOU DESIRE THE SECRET CATEGORIES? Simply put, these secret categories are not selectable in the KDP dashboard…that’s why. For this reason, they will definitely have lower competition than the available ones on the Amazon dashboard. Be sure to check out my article on how to find low competition categories that will help you to reach best-seller status here. I don’t have any solid numbers, but I don’t think it is too far off from the truth to believe that only 35% or less of self-publishers know about the ‘secret’ category list, and only a smaller percentage actually know how to unlock them. That means that more than 65% of all kindle self-publishers target the pre-generated list of categories that you find on the Amazon dashboard. Starting to see why unlocking that list can be important? 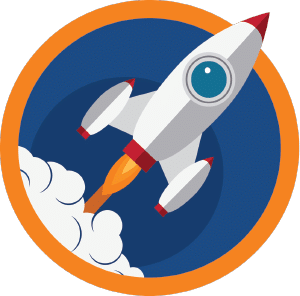 If you need help finding the most opportunistic categories, then you should check out my favorite software for the job: KDP Rocket. When you go to upload your book for the first time, you’ll be offered a select list of categories to choose from. You will probably notice that these categories are very broad and do not include every subject that you see other books listing for. Amazon does this because they want new books to be included in well-known e-book lists. Over time, Amazon will sometimes automatically add a book to a secret category because it feels as though it belongs. However, if you’re like me, then you don’t want to just leave it up to fate and hope that Amazon will one day decide to include your book in a particular category. 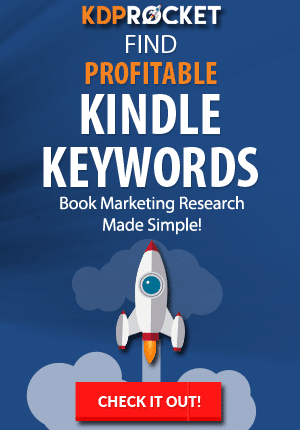 Try to place the title of your category as one of your “Amazon Keywords” in your Kindle submission form. This will automatically tell Amazon that your book belongs in that particular category. If you can legitimately place that category name into your title, subtitle, and/or summary, it should also help to persuade the Amazon algorithm that your e-book is best served under that particular category. In a way, this is a sign that your book is about that particular subject and should, therefore, be included in the category. 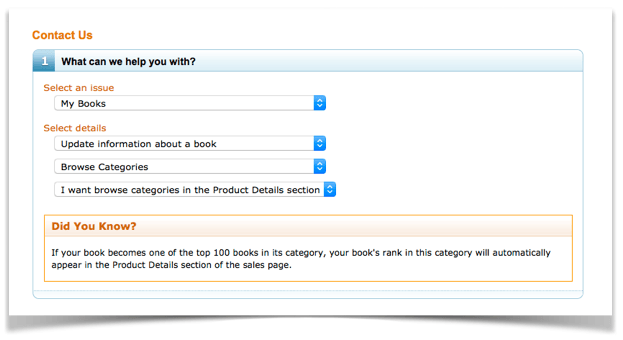 These two steps will help Amazon to see your book as a part of that category. Potential Step 3: Flat Out Tell Them! However, if that doesn’t work and your book isn’t automatically added into the particular category, there is one more step in which you can get Amazon to notice it. Contact Amazon and ask them to include your book into that particular category. Amazon will then look at your book, it’s cover, and the information you placed on your product page and will make a determination as to whether or not your book will be suitable inside a particular category. Be sure that this category is a legitimate fit for your book or else otherwise Amazon will reject your claim and might even penalize you for such a request. So don’t be SPAMMY! Under “Select An Issue” select “My Books”. Under “Select Details” select “Update Information About a Book”. Then “I want to browse categories in the Product Details section. Next, in the “Question/Feedback” area provide your book’s ASIN and which browsing path you would like as your new category and which category this will replace. Make sure you start with Kindle and not book…unless this is for the physical book. I have made this mistake before and of course, was rejected on the basis of me being stupid. Once you’ve submitted your email request, give it a few days and check to see whether or not Amazon placed in that category. In most cases though, authors will see the fruits of the email labor in a matter of 24 hours…which is nice. So, there you have it. 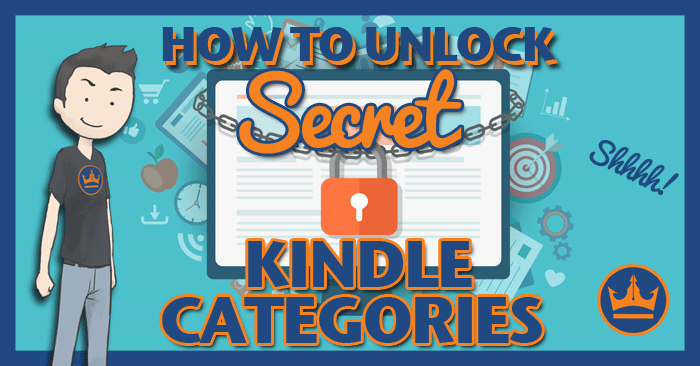 Simple steps towards unlocking the coveted secret categories of the Amazon Kindle world. I hope you enjoyed this and please comment below on how these process worked for you. 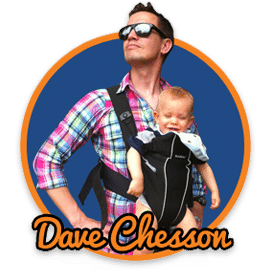 Hey Guys, I’m Dave and when I am not sipping tea with princesses or chasing the Boogey man out of closets, I’m a Kindlepreneur and digital marketing nut – it’s my career, hobby, and passion. Self Publishing Courses: Which one is best for you?